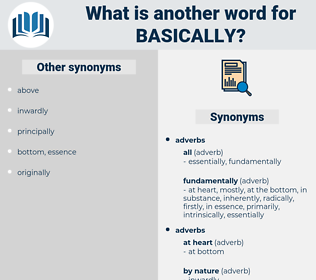 What is another word for basically? primarily, substantially, mainly, largely, virtually, mostly, actually, broadly, chiefly, predominantly, generally, inherently, really, roughly, ultimately, intrinsically, basicaily, crucially, radically, almost, simply, originally, effectively, significantly, absolutely, exactly, totally, initially, indeed, particularly, materially, globally, technically, specifically, critically, profoundly, completely, nearly, hardly, normally, typically, literally, predominately, thoroughly, considerably, notably, overwhelmingly, merely, especially, fairly, Preliminarily, genuinely, usually, basis, theoretically, utterly, factually, quite, drastically, eminently, principle, vitally, tentatively, approximately, foremost, clearly, dramatically, conceptually, scarcely, obviously, strictly, plainly, purely. 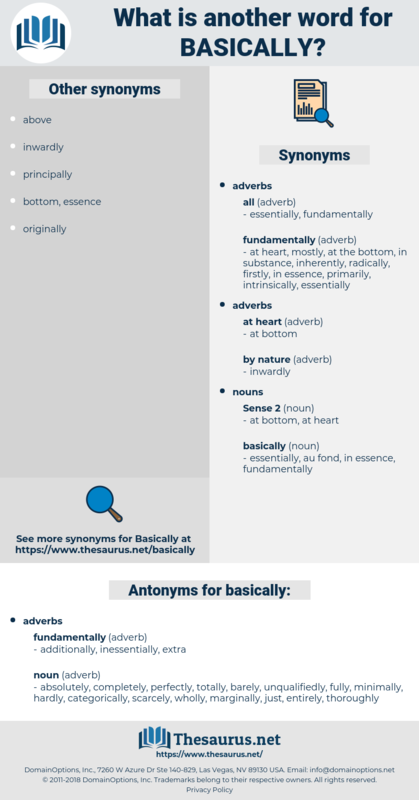 fundamentally, principally, practically, Substantively, basic. absolutely, completely, perfectly, totally, barely, unqualifiedly, fully, minimally, hardly, categorically, scarcely, wholly, marginally, just, entirely, thoroughly. It would not be accurate to say that the cattle industry was basically much influenced or governed by northern or eastern men. bejewel, bush willow, beagle, boyishly, bifocal, biweekly, b cell, bagel, buckleya, Babacu Oil, bog soil, bifacial, boswell, bascule, Babassu Oil, bicycle wheel, baycol, beckley, boucle, bisexual, basel, buchloe, boswellia, Bahia Coquilla, basely, big wheel, boggle, bicycle, buccal, beguile, biaxial, basil, basle, basal, buckle, bezel, bushel, buccula, bugle, beigel, biaxal, bessel.